We spent the New Year in windy, cold Chicago away from the blissful Sunny & Seventy San Diego to take in the sights, search for the Best Chicago Hot Dog, sample some Real Deep Dish Pizza and watch the Chicago Blackhawks crush the struggling Edmonton Oilers at Chicago’s “Madhouse”, Chicago’s home of NHL Hockey! Kathleen pounced into action with her Smartphone, searched the Edmonton Roster and soon confirmed my suspicions. She then located Eric Belanger, whom our Daughter adores and pounced on him as well (Umm…for an Autograph). She cursed that she didn’t work out that morning in the hotel Gym as surely the Oilers did. It was awesome just seeing these guys. Now about the actual game! 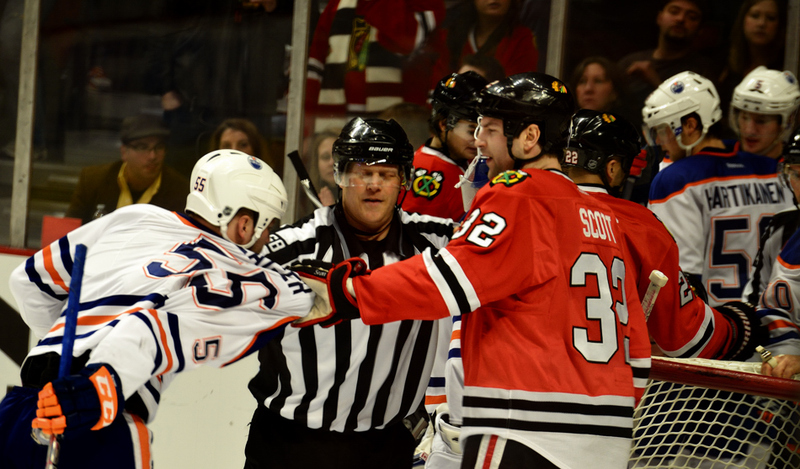 After the opening ceremonies, the rabid Chicago crowd was whipped into a frenzy after two soft goals against Edmonton. We were treated to their “We got a goal” crowd song – Hockey Fans will know this one. 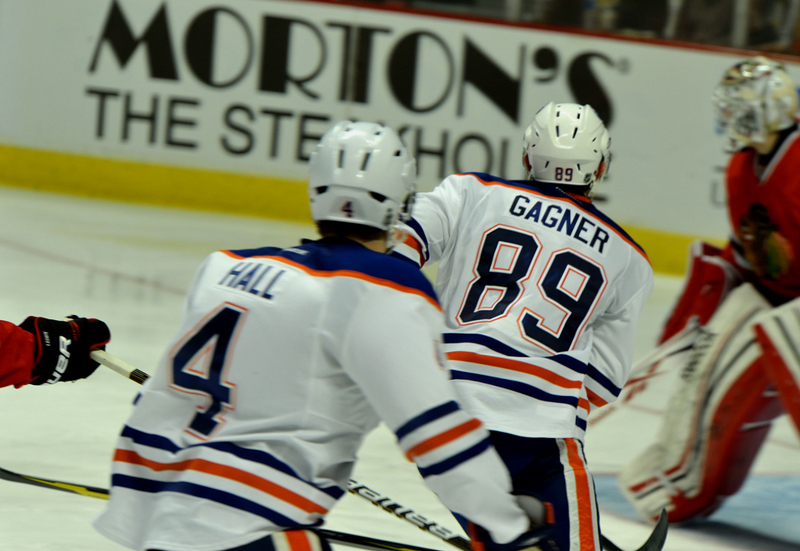 Edmonton was not done and came blazing back – they are a young team and Fast! Here is Gangner attacking the net with Hall looking for a rebound….and being hooked by a Chicago defender. 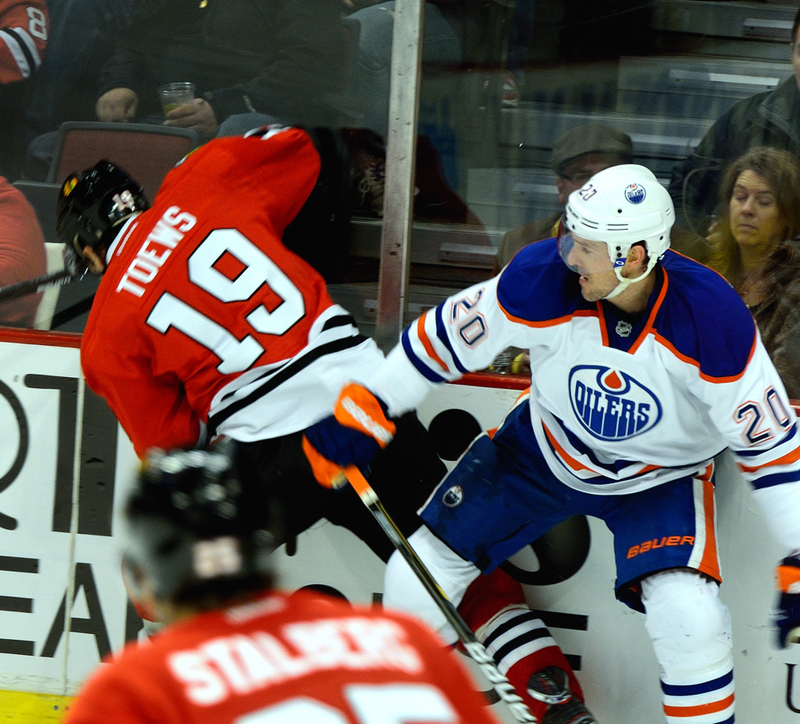 With The Oilers on the attack, Chicago draws a Hooking Penalty on Taylor Hall (#4) giving Edmonton the man advantage. 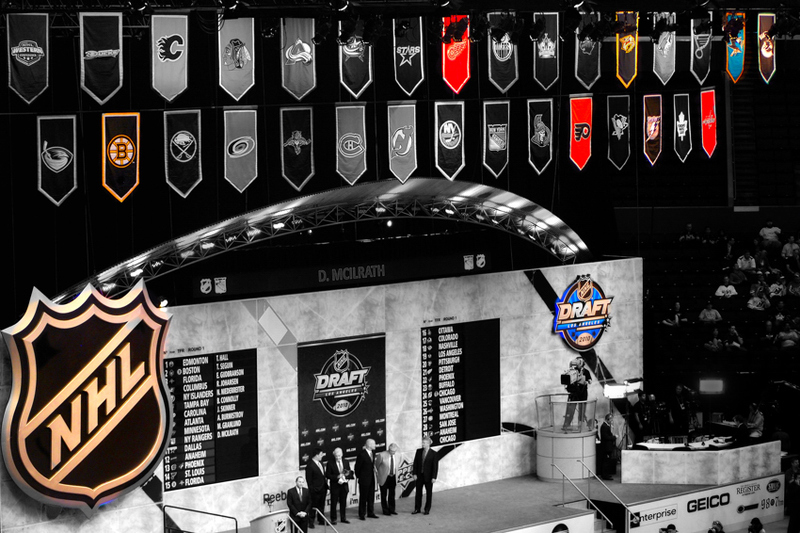 (By the way…We saw Taylor Hall being picked by Edmonton at the 2009 NHL Draft in Los Angeles – check previous posts). I swear it went in Ref! Chicago’s goalie, Corey Crawford (a Montreal native), was stellar between the pipes stopping Gagner who looked stunned that the puck did not go in – Gagner is a real Sniper when it comes to pin point shooting but was no match against the intuitive net minding skills of Crawford! As the two teams settled in, things turned a bit more physical. 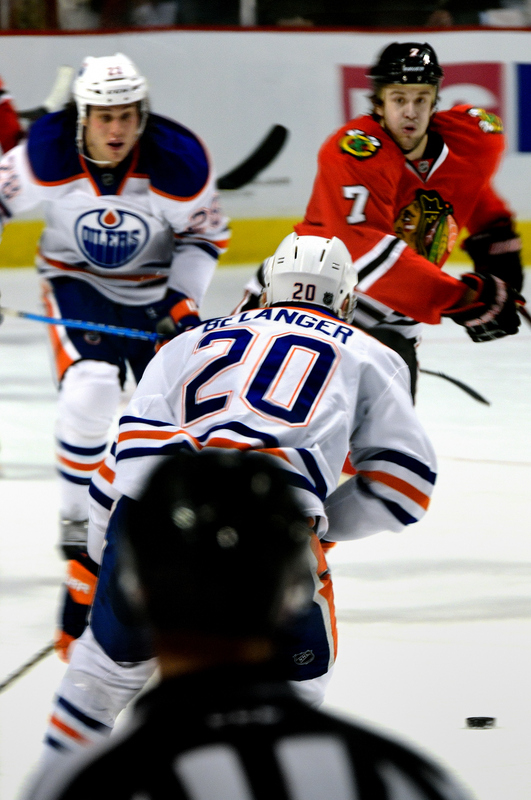 Here we see Eric Belanger and Jonathan Toews tangling behind the net. 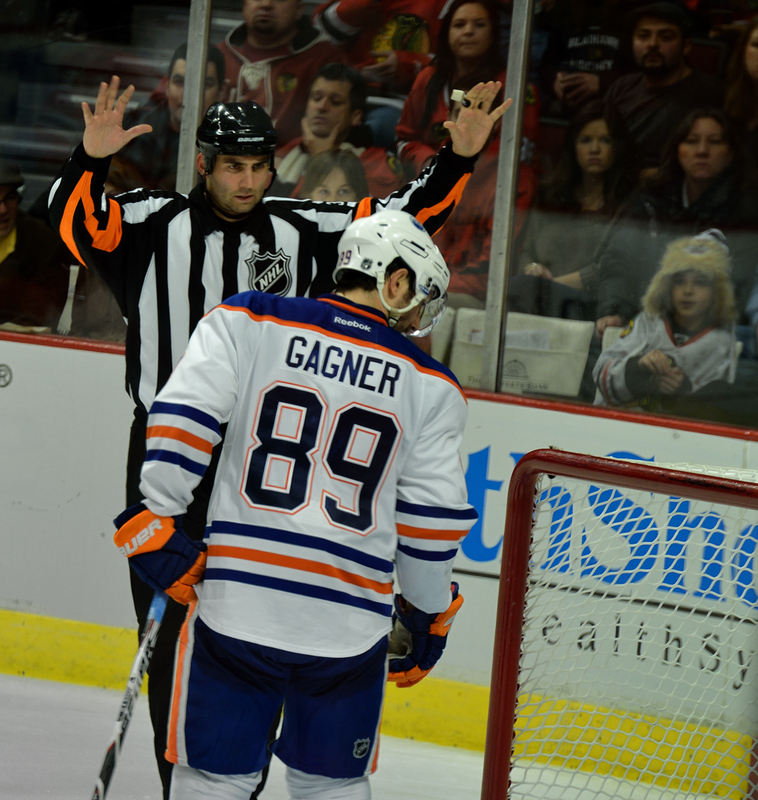 Penalties played a large role in this match, one of which ended in a Chicago suspension, two Edmonton goals, and two players injured. The NHL has to do something about violent headshots and boarding – this almost always leads to injuries and even worse, concussions. Pittsburgh Penguins Sydney Crosby is still not back to 100% after close to a year recovering from a concussion! (Above) Physical play turned to a bit of roughness – things always get a bit touchy around the net, often leading to “altercations”. The Refs were quick to stop this from becoming a fight. Refs have such a tough job, Judge, Jury, Diplomat and always skating for the entire game! Below, Eric Belanger pours on the pressure with the NHL Ref watching closely! Tensions rise as the game is tied. 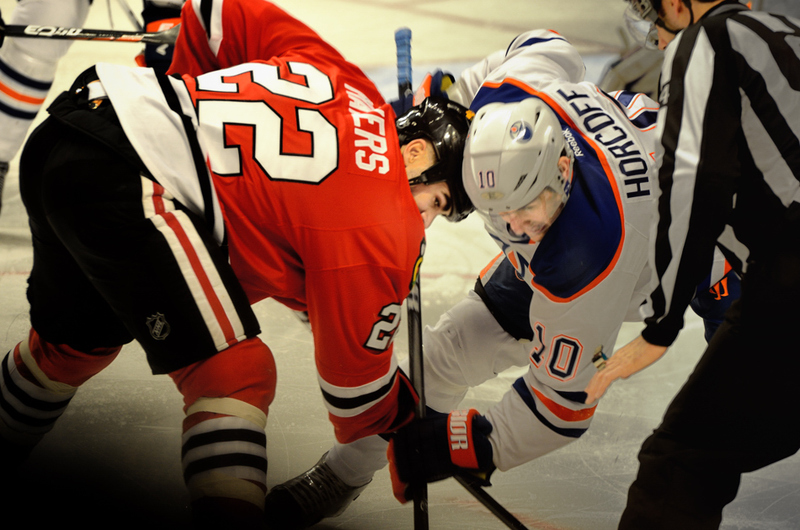 Edmonton gets the next goal, and Chicago counters to again tie the game at 3 to 3. In the third period, Edmonton’s young guns score again. Chicago takes a Time Out to figure out how to overcome Edmonton’s defense. 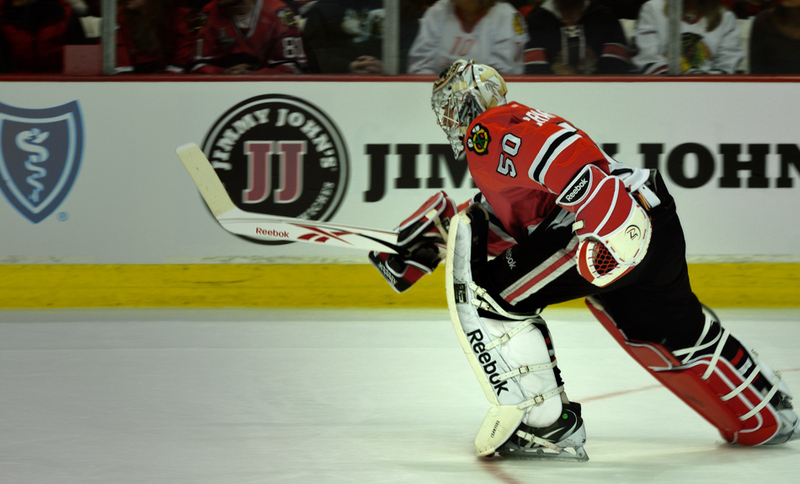 During the final minutes of the game, the Chicago goalie, Corey Crawford, races to the bench to allow Chicago an extra man on the ice and leaving the Chicago net empty… hopefully over powering Edmonton, get a goal, and force the game into overtime. The Chicago pressure was immense, the movement of their forwards was precise, shots were hard and accurate but to no avail. The underdog Oilers survived the onslaught of the best team in the NHL and left Chicago with a win under their belt. Hockey is never predictable! Can you guess who is still in the running for the 2011 Stanley Cup? 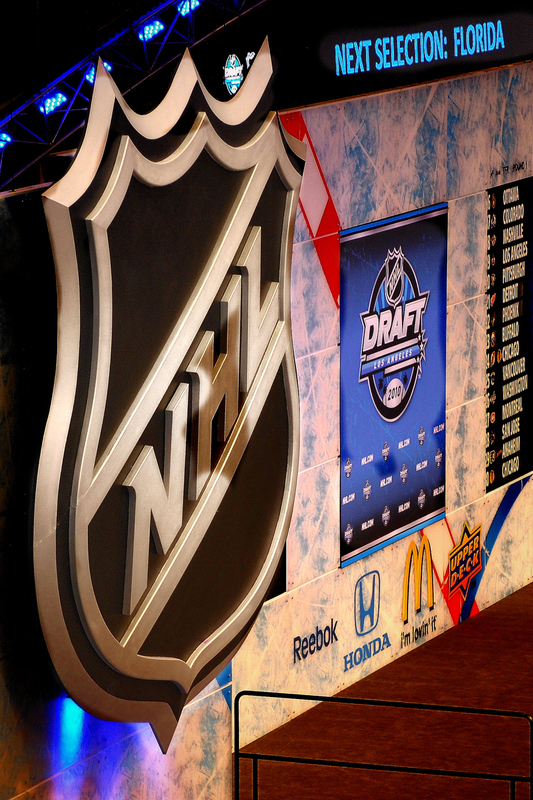 I was invited to National Hockey League Draft in Los Angeles this Spring. What an exciting time for all the young prospects and the proud parents and friends anxiously waiting where the next prospect would go! It is interesting to see which teams remain at this time making their charge to the Stanley Cup! The Stanley Cup is awarded annually to the National Hockey League (NHL) playoffs champion after the conclusion of the Stanley Cups Finals. It has been referred to as The Cup, Lord Stanley’s Cup, The Holy Grail. The Stanley Cup is surrounded with numerous legends and traditions, the oldest of which is the celebratory drinking of champagne out of the cup by the winning team. Unlike the trophies awarded by the other three major professional sports of North America, a new Stanley Cup is not made each year; Cup winners keep it until a new champion is crowned. It is unusual among trophies, in that it has the names of all of the winning players, coaches, management, and club staff engraved on its chalice. The original bowl was made of silver and has a dimension of 18.5 centimeters (7.28 inches) in height and 29 centimeters (11.42 inches) in diameter. The current Stanley Cup, topped with a copy of the original bowl, is made of silver and nickel alloy. Today, it has a height of 89.54 centimeters (35.25 inches) and weighs 15.5 kilograms (34.5 lb / 2 st 6½ lb). The slapshot is faster (or as Goalies say, “Heavier” due to its impact) than other shots in Hockey, and because of the violent motion involved, somewhat less accurate, and also takes longer to execute. 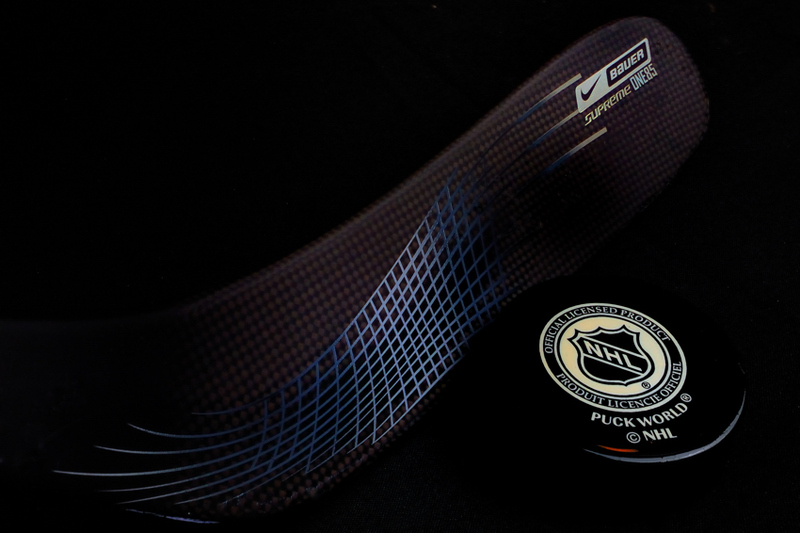 The secret is to have the blade of the stick strike the ice about 1-2 inches in front of the puck. This causes the shaft to bend significantly and by the time the blade hits the puck, there is tremendous energy loaded in the shaft which then gets tranferred to the puck in a spring like fashion! This took me countless hours at the Rink at at home in the garage to master. At the yearly NHL All-Star “Hardest Shot” skill competition, the winning slapshot typically propels the puck at around >105 miles per hour! 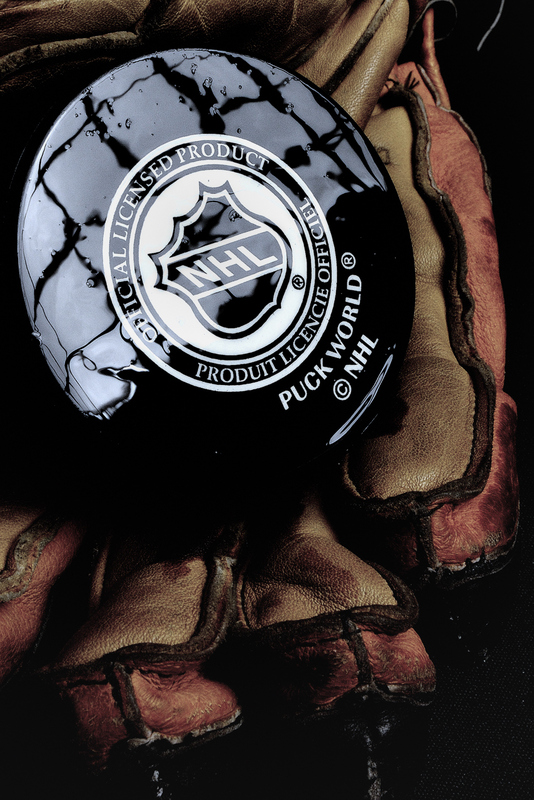 This is a Studio shot taken of a Vintage Bruins hockey glove and an NHL puck – funny that the glove is Vintage now…I used it when I played PeeWee Hockey in Canada!